A HUGE Shout-Out to Mrs. Vermont 2015! 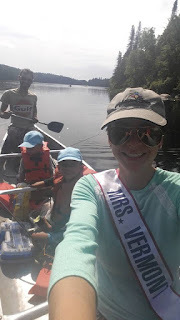 Dorilee LeBlanc, AKA Mrs. Vermont 2015, is building her pageant platform around getting kids outside, active, and re-connected with nature, and we have enjoyed an amazing partnership with her this summer. From assisting with our Random Acts of Camping promotion to hiking up Owl's Head to help kids reach their Venture Vermont goals, she has brought boundless energy and fun to parks all over the state. Stay tuned to find out how to watch her compete in the Mrs. America 2015 Pageant, which will be taking place in Las Vegas, Nevada from September 20-24. We can't wait to see her represent Vermont! Sand Bar Bonus Activity on the Beach - Sandcastles! And of course, who could forget...she announced the Elmore State Park Random Acts of Camping winners by riding in on a paddle boat! As most of you know, the Vermont State Parks have been hosting artists in several parks this summer, all of whom have been working on various projects and teaching workshops. 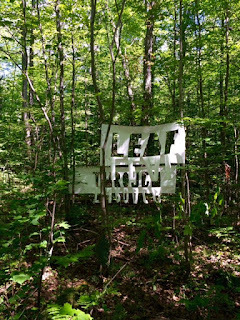 Lynn Sullivan's installation will be up at the Groton Nature Center along the Coldwater Brook Trail (a moderate, family-friendly hike) until September 7th. Her work "plays with language juxtaposed against the backdrop of the natural world," she explains. 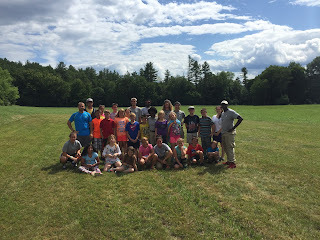 The inaugural summer of the Muckross Youth Day Camp is currently underway in Springfield, VT, and is serving more than one hundred Springfield youth in Grades 1 through 8! educational opportunities with an emphasis on Springfield youth and elders. Terry Carroll, a native of western New York, is a VISTA volunteer serving with Vermont State Parks since last August. He has led the summer camp project from its inception, and is serving as de-facto camp director this summer.